1)Should i use less QPI/Vtt? Is 1.21 too much for this OC? Is it true that the lowest i can use is 1.15V because my ram has 1.65V and the difference must be lower then 0.5V? 2)About the PCH and CPU PLL did it do ok by retyping the normal values or should i leave them on AUTO? Last edited by wazza300; 10-07-2011 at 04:45 AM. I was told that you shouldn't leave any values on AUTO especially on GB boards when you are overclocking. Do you suggest i put AUTO and see what values it has put there? Also if i lower qpi/vtt to lets say 1.18 or 1.19 will i see any benefits as for the temperatures or the longevity of the system overall? 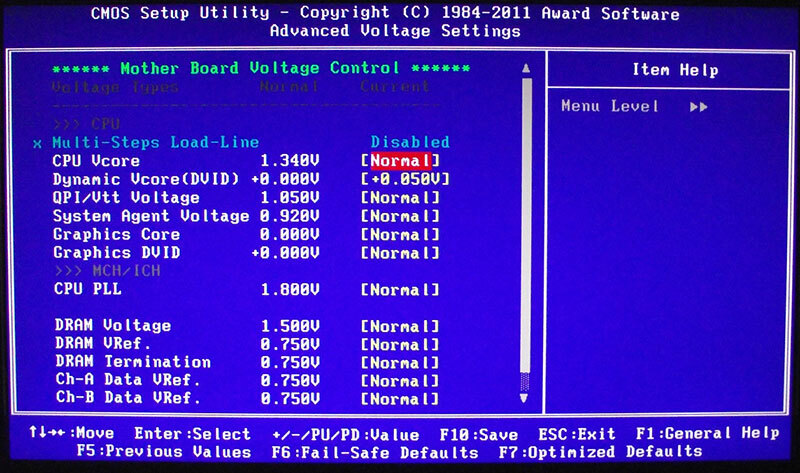 Last question : on advanced voltage settings you have 2 columns Normal / Current. On the section where you select the values if you select Normal does it mean it saves the value of the Normal column? This is kinda what i mean, i don't have that motherboard but i want to set it up like this. Last edited by Darkling; 10-07-2011 at 08:14 PM. Having some second thoughts about my overclock and i would appreciate some suggestions. First of all i am thinking of disabling the i5 750's Turbo boost function and have a constant multiplier x20. If i do that i will set 180 BCLK to achieve 3.6ghz costant OC. I have a feeling that turbo mode requires more voltage and let me explain. While testing with Prime i used to shut down workers in order to see how the turbo works and how much voltage it uses. So it used 1.216V when running all four cores at 3.2ghz and 1.264V when running one or two cores at 3.86ghz. I have a feeling that if i disable turbo and set the OC to 3.6ghz it will use around 1.23-1.24 which is lower volts for only 200mhz loss of CPU speed. Load-Line Calibration --> I know if i enable this i will have less vdrop but i am thinking of Disabling it, AUTO seems to enable it. x Dynamic Vcore(DVID) --> Normal or +0.00000V is the same? I don't want to use that yet. Maybe if it gets unstable i will add some. PCH Core --> Normal value is 1.050V, either i will retype it or use AUTO as you said. CPU PLL --> Normal value is 1.800V, either i will retype it or use AUTO as you said. wazza, please review and corrent if any suggestions. I just want to know if the overall system performance will be better when using higher BCLK and higher Ram speed cause they will be running at 1440 than it's rated 1333 speed.